On this day in 1796, the great French engineer and physicist Sadi Carnot was born, a man whose only published work – Réflexions sur la puissance motrice du feu et sur les machines propres à développer cette puissance (Paris, 1824) – marked the very foundation of modern thermodynamics. 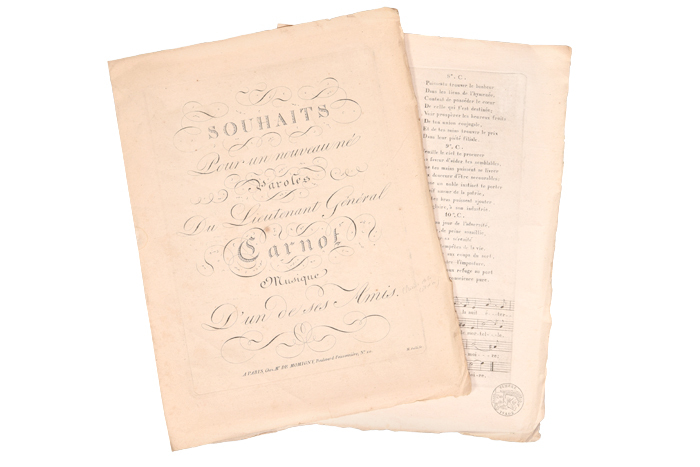 To celebrate this birth, his father the famous statesman Lazare Carnot had a song published, written by himself and his musician friend Prieur-Duvernois, a member of the revolutionary Comité de Salut Public like Lazare himself in 1793-1794. Here’s an extremely rare piece of occasion, in honour of an exceptional being!